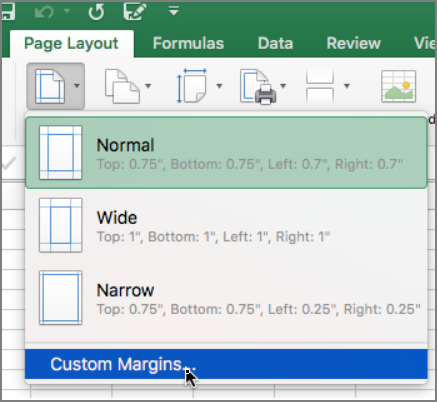 To better align a Microsoft Excel worksheet on a printed page, you can change margins, specify custom margins, or center the worksheet horizontally or vertically on the page. Page margins are the blank spaces between the worksheet data and the edges of the printed page. Top and bottom page margins can be used for some items, such as headers, footers, and page numbers. In the Page Setup dialog box, under Center on page, select Horizontally and Vertically. This will center the sheet on the page when you print. On the Layout tab, under Page Setup, click Margins. Click Custom Margins, and then adjust the margins as you want them to appear. To center the sheet on the page when you print, under Center on page, select Horizontally and Vertically. Tip: To hide the page break lines, on the Layout tab, in the View group, clear the Breaks check box.